Growing: At eighteen months (a year and a HALF! 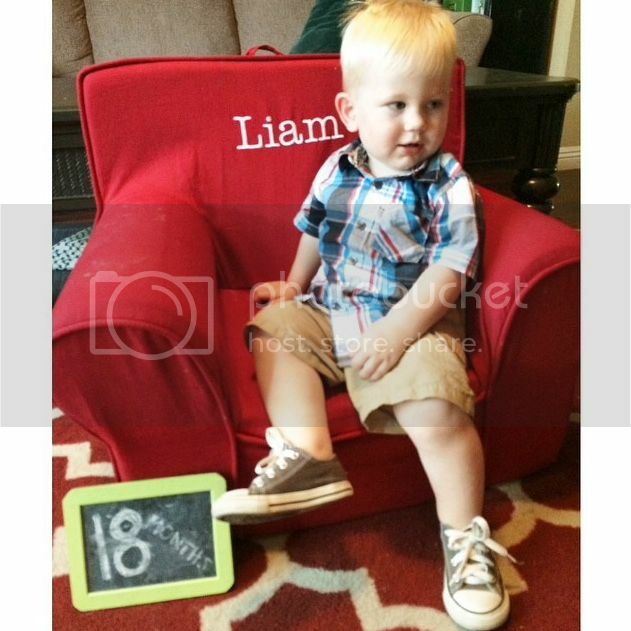 ), Liam weighs 29 pounds 3 ounces (95th percentile) and is 35 inches tall (99th percentile). For comparison's sake, Chris was that exact same height right around 19 months and weighed just a few ounces more. Crazy! He has twelve teeth: four top and four bottom, and four of his molars. The eye teeth are starting to pop through, as well. Wearing: He's in all 2T clothes and 3T pajamas, but it seems like he will be in all 3T clothes in no time. He is in size 5 diapers and he wears size 7 shoes (but we just moved him up to an 8 in his tennis shoes). Eating: He eats three meals a day with lots of snacks in between. He takes a cup of milk in the morning, after his afternoon nap, and right before bed. His favorite foods include beans, applesauce pouches and yogurt. His ultimate favorites are still bananas and blueberries. Playing: His favorite things to play with are building blocks, balls, our cell phones (especially to call Siri), and books. 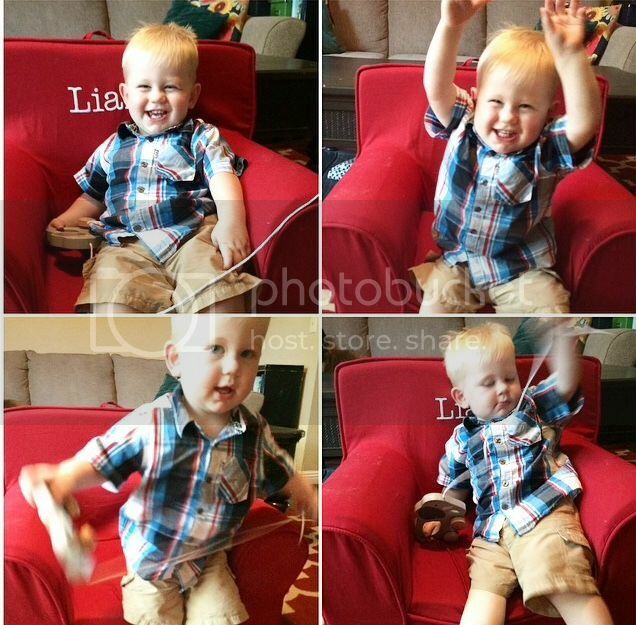 He can kick a ball like a champ, so Chris is counting down the days to enroll him in soccer. He basically reminds us of a bouncy ball - always going from one thing to the next. Saying: His vocabulary seems to have exploded this last month! He says a ton of words that we can recognize, including more (including sign), milk (including sign), again, dog, Daddy, Mama, Bubba (his stuffed elephant that he named all on his own), bird, duck, ball, bubbles, pew-wee (when we take of his shoes or we are changing a dirty diaper), cheese, cracker, cat, and so on. There are probably 25-30 words in his vocabulary. He also does the signs for food, more, milk, medicine and again. Loving: He loves Mia (and she is still patient with him), music and dancing, climbing on things he shouldn't be climbing on, and running into his school each day.